Online training is now available!!! The Apartment Association of Greater New Orleans in partnership with Grace Hill is proud to provide the highest quality online educational offerings in the industry. Developed by Grace Hill, these courses offer a unique interactive learning experience aimed at enhancing the quality of work at all levels in our industry. As an added bonus, 50% of required annual CEC credits may come from these online courses! 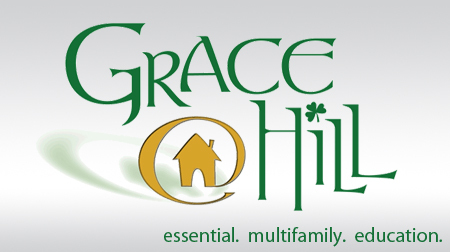 Since its inception, Gracehill.com has provided education and networking opportunities for members of the multifamily industry. Gracehill.com's Membership roll has grown to include 316,594 members worldwide which include multifamily associates representing every job description and every state in the Union. In addition, more than 500,000 courses are taken each year from Gracehill.com, making it the leader in providing affordable and easy access to the best in online training for multifamily employees worldwide. Download the Online Training Information package and Online Training FAQ below for more information. When you are ready to begin training, simply click the “Begin Online Training” button below, and you will be directed to Grace Hill’s home page where you can sign-up for a User ID / sign-in to complete an online training course. From site-level employees to corporate personnel and everyone in-between, 24 / 7 education is now available to you with the click of a mouse.